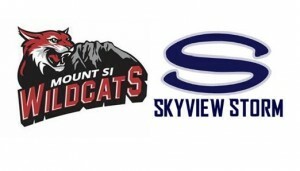 GAME NOTES: Mount Si is led by quarterback Cale Millen, son of former UW quarterback Hugh Millen. Despite that Husky lineage, Cale Millen has verbally committed to Oregon. In two games this season, Millen has passed for 612 yards and 10 touchdowns on 37-of-48 passing. The Wildcats piled up 486 yards on Kentwood, the defending 4A North Puget Sound Cascade champion. Colby Botten has 10 catches for 214 yards and Jonny Barrett has 12 catches for 272 yards. Skyview QB Yaro Duvalko has passed for 614 yards and nine TDs, leading Clark County. Gavin Baskette, 18 catches for 223 yards, is his top target. RB Jalynnee McGee has rushed for 206 yards for the Storm.